Education plays a vital role in building the future of our nation by transforming lives and communities. We have several educator heroes who help students aim high and achieve their potential, often meeting and overcoming considerable challenges along the way. Recently Delhi based MT Research & Educational Services (MTRES) came up with Teaching Excellence Awards (TEA) 2018, to recognize the monumental role teachers play in our society as they instil a desire to learn and achieve and create tomorrow’s leaders. 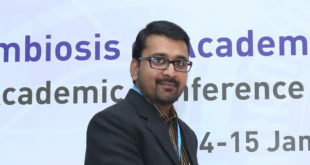 Meet one of the awardees, Dr. Sandeep Poddar, Assistant Professor and HoD, Department of Commerce, Smt. Parmeshwaridevi Durgadutt Tibrewala (S.P.D.T.) Lions Juhu College of Arts, Commerce and Science, Mumbai, Maharashtra, who has been honoured with Excellent Teacher Award in MTRES TEA 2018.